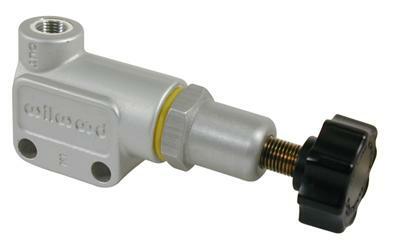 Adjustable rear proportioning valve with pipe thread adapter to common 3/8 brake fitting. NSTALLATION & ADJUSTMENTS - Proportioning valves are normally installed in the rear fluid line to prevent the rear wheels from locking before the front wheels, or to give a driver the ability to make fine adjustments in front to rear bias percentage on the track to compensate for tire wear, fuel load burn-off, or changing track conditions. It is generally not recommended to attempt to reduce front wheel braking capacity. Use only the two .25" body holes to secure the valve to a mount. Do not attempt to remove the adjuster knob or valve body end cap to facilitate thru-panel mounting. Two 1/8-27 NPT to 3/8-24 inverted flare fittings are supplied to adapt double flared hard brake lines to the valve. Connect the "IN" port to the pressure line coming from the master cylinder. Connect the line going to the calipers to the "OUT" port. The adjusting knob is marked with an arrow indicating the direction required to decrease line pressure to the calipers. The knob rotated all the way out (counter-clockwise) will provide a maximum pressure reduction of 57%. Rotating the know in (clockwise) will incrementally increase line prressure, up to full pressure. If the range of adjustment in the valve is not sufficient to properly balance the vehicle’s bias, changes to other components within the system may be necessary. TESTING THE SYSTEM - Do not attempt to operate the vehicle until the system has been fully tested under controlled conditions in a safe location. After the system has been bled, checked for leaks, and the proper pedal resistance and travel have been determined, make a series of low speed stops, then gradually progress to normal operating speeds. WARNING - Adjustable proportioning valves are designed for tuning and balancing custom brake systems on performance, racing, and other types of special purpose vehicles. They are not designed as direct replacements for any OEM application. This has become a popular Master Cylinder in the aftermarket because of its light weight and mean look. It weighs only 2 pounds and has the 1/2 inch and 9/16ths port sizes that most GM vehicles have, which makes it a great fit. It does have a different push rod depth than the GM "deep hole" standard, so you would have to cut the rod down on your booster if you have the longer rod, but a plug will make it work with a "shallow hole" GM booster. If you order it from us with a Hydro-Boost brake booster, we will machine everything to mate correctly. This is one of the most common and universal master cylinders for the aftermarket. It has an 1-1/8" bore, and can be set up to be used on GM, Ford, and Dodge vehicles. 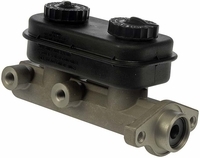 A versatile master cylinder, it has a 1-1/8" bore size, a GM bolt Pattern, and is light weight with the plastic reservoir. It has 9/16ths and 1/2 inch port sizes that are a fit with tons of GM applications, and face towards the fender. This master is good for customers looking for a stock plastic reservoir look, who want a "factory" look on their good. If you pick this master out with a Hydro-Boost kit, we can set it up to fit on a GM, Ford, or Mopar vehicle. Holds a 2 pound pre-load on your brake caliper pistons, which isn't enough to apply your brakes, but makes them apply quicker when demanded. It can be used when a master cylinder is mounted equal to or below the horizontal plane of the calipers or drum brake wheel cylinders. This valve prevents fluid flow-back to the master cylinder reservoir which can cause excessive brake travel or “pumping” of the pedal to engage brakes. Install the valve as close as possible to the master cylinder and position the end marked “M.C.” toward the master cylinder and the end marked “OUT” toward the brakes. Ports in the valve are 1/8-27 NPT threads and will accept standard inverted flare tube nut adapters. A 2 lb. valve is designed for disc brakes and a 10 lb. valve for drum brakes. If the vehicle has a single outlet master cylinder and a disc/disc system, only one 2 lb. valve is required. If the vehicle has a single outlet master cylinder and a disc/drum system, a 2 lb. valve is required in the disc brake line and a 10 lb. valve in the drum brake line (after the tee fitting). Balance bar systems require the appropriate valve just outside the master cylinder. Holds a 10 pound pre-load on your brake caliper pistons, which isn't enough to apply your brakes, but makes them apply quicker when demanded. A residual pressure valve can be used when a master cylinder is mounted equal to or below the horizontal plane of the calipers or drum brake wheel cylinders. This valve prevents fluid flow-back to the master cylinder reservoir which can cause excessive brake travel or “pumping” of the pedal to engage brakes. • Maintains full separation between the front and rear fluid circuits when used with tandem outlet or dual mount master cylinder assemblies. • Bias proportioning adjustment is provided in the rear fluid circuit. • The front circuit has a single inlet and two outlets for optional line routing. • A fluid port with a pressure switch responds instantly to pressure in the front fluid circuit for brake light activation. A wiring pigtail with a protective boot is included with the switch. 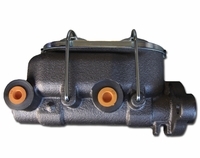 NOTE: Although the combination valve may mount in some OEM locations, it is not a direct replacement for any OEM unit and may require modifications to the brake lines and/or the mounting location for installation. Bias proportioning adjustments will be specific to each vehicle. 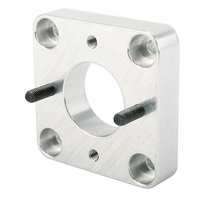 INSTALLATION INSTRUCTIONS: Mounting: If equipped, the OEM combination valve bracket may provide the ideal mounting location for the combination valve. 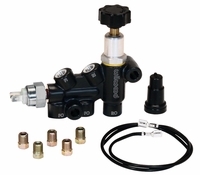 Otherwise, position the Wilwood Adjustable Combination Proportioning Valve in a convenient location in close proximately to the master cylinder(s) using customer supplied hardware or a fabricated bracket. Line Connections: The line connections on the Wilwood combination valve are 3/8-24 with an SAE inverted flare for standard 3/16” (-3) brake line. The supplied tube nuts can be double flared onto any 3/16” brake line. However, if your lines are already flared with 3/8-24 fittings, then the tube nuts are not necessary. 1. The line from the master cylinder for the front brakes connects to the port marked “FI”, (front in), on the top of the combination valve, refer to Figure 1. 2. The two ports on the bottom of the valve marked “FO”, (front out), will be the supply lines to the front calipers. These ports can be used to run individual lines to each caliper. Or if preferred, one port can be blocked, and a single line run from either “FO” port to a “T” plumbed downstream, splitting the lines to feed each front caliper. The function of the valve will not change. 3. The line from the master cylinder for the rear brakes connects to the port marked “RI”, (rear in), on the top of the proportioning valve. 4. The single port marked “RO”, (rear out), connects to the line going to the back of the car to feed the rear calipers. NOTE: Tube wrenches are always preferred for tightening the fittings. Swtch Connections: If your vehicle is already equipped with a brake light switch on the brake pedal, the switch in the combination valve does not need to be used, and it may be removed. Plug the unused port with a 1/8-27 NPT pipe plug (not included). For all other applications, or if you wish to eliminate the switch on the brake pedal, use the switch in the proportioning valve block. 1. Before connecting the lead wires, cut the ends (that do not have the clip) on a 45° angle. Coat both cut ends with Dielectric Grease to ease slidingthewiresthroughtheholesinthedustboot. Slidetheclipsonto the spade connectors and cover with the dust boot. 2. Connect one lead of the brake light pressure switch to a 12 volt, 15 amp fused circuit. This should be a battery direct, always hot circuit. Do not use an ignition key switch activated circuit. 3. Connect the other pressure switch wire to the lead wire going to the brake lights. 4. Be sure the brake lights are properly grounded, and all connections are secure and insulated. Fluid: The Wilwood proportioning valve block is fully compatible with all types of brake fluid including DOT 3, 4, 5, and 5.1 fluids. DOT 3, 4 and 5.1 fluids are fully miscible, but DOT 5 silicone fluid should never be mixed with any other fluids. Always follow the vehicle manufacturers fluid recommendations for any vehicle. A complete flush and fill with fresh fluid is recommended for all installations. For best performance, use Wilwood Hi-Temp 570, EXP 600 Plus, or Wilwood FIVE DOT 5 high performance fluids. Bleeding: To properly bleed the brake system, begin with the caliper farthest from the master cylinder. For fixed mount calipers with two bleed screws on top, bleed the outboard bleed screw first, then bleed the inboard screw. Repeat this procedure until all calipers have been bled, ending with the caliper closest to the master cylinder. Once the system has been bled, the pedal should maintain a consistent, firm feel. If the pedal returns to a spongy feel after it has rested from the bleeding process, this is an indication that air still exists in the system. If this occurs, repeat the bleeding process until all air has been purged and the pedal retains a firm feel. NOTE: When installing a new master cylinder, it is important to follow proper bench bleeding procedures. 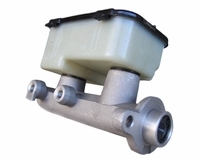 Follow the installation instructions provided with the new master cylinder. If a firm pedal can not be achieved after bleeding the system, the master cylinder may not be properly sized for the brake system. Proportioning Valve Adjustment: The proportioning valve is used to adjust the rate of increase in rear brake line pressure, relative and proportionate to the increase in front brake line pressure. For safety and performance, the rear brakes should never lock before the front brakes. Otherwise, an out of control situation could occur. 1. Begin with the valve in the full proportioned (least pressure) position by turning the knob all the way out (counter-clockwise rotation). 2. In a safe location, make several hard stops from 30 MPH observing the function of the rear brakes. If the rear brakes do not lock up before the front, gradually increase the rear line pressure by rotating the valve clockwise (two turns each time). 3. Continue these adjustments until the maximum amount of rear brake pressure can be achieved, and no wheel rear lock is observed. 4. Test the vehicle again at 50 MPH and make any additional adjustments as needed.